Surat-Shaan has struggled finding his authentic self, not knowing what was missing, but now feels happy and proud with his transmasculine identity. Shaan runs the Twilight People project through Liberal Judaism, alongside other international campaigns for trans people, with hopes to inspire more projects exploring intersections of faith, spirituality and gender. “Realising I can be a transgender Jew was just fantastic. I can’t be just trans, and I can’t be just a Jew. It had to be both. When I was younger, growing up in a secular environment, no one ever told me I was a girl, no one told me I was a boy. I knew nothing about gender. I knew nothing about faith. Finding out who I was; my faith, my spirituality, my community but also finding my gender, they were parallel. It almost happened at the same time, and all things influenced each other. I’m ready to go, ready to get on with my life and my faith and my gender, and my projects, which are probably more important than anything now. The Rainbow Jews project that I founded helped me with my coming out, and Twilight People is really important for me too, as it’s about the layers of our identity – body, mind, spirit and more. Other people’s stories and experiences really resonate, no matter how different they are. Hearing other people’s stories and finding my faith, led me to not just say I’m trans, but to start doing trans. 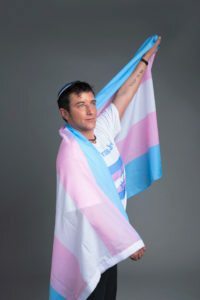 I wear the trans pride flag like a Jewish prayer shawl. This is exactly what I looked like at Tel Aviv Pride 2015, which was dedicated to the trans community.